Today, air frying is all the rage. Air fryers are known for being quick, easy, and healthy cooking appliances. With so many air fryer models on the market, which one should you choose? Perhaps you’ve seen the numerous television commercials and infomercials advertising the Power Air Fryer Oven. Is it worth the hype, and is this appliance right for you? Below, you’ll learn how the Power Air Fryer Oven works, what comes in the box, what accessories are available, and what users are saying about this air fryer model. Then, you’ll be equipped to make an informed purchasing decision. What is the Power Air Fryer Oven? What Comes Inside the Box? Should You Buy the Power Air Fryer Oven? Like all air fryers, the Power Air Fryer Oven uses convection technology to quickly cook food, leaving food items moist on the inside yet crispy on the outside. Heating elements warm the air inside the appliance to intense temperatures, and this superheated air is then circulated by fans. You may remember previous commercials advertising the Power Air Fryer XL, an egg shaped air fryer. The Power Air Fryer Oven has since replaced the Power Air Fryer XL. The abbreviation “PAFO,” an acronym of Power Air Fryer Oven, is often used as a shorthand to describe the oven. Inside the PAFO, the racks or “shelves” consist of metal screen racks. The mesh-like design of the shelves allows for maximum airflow and permits the grease to drain through and into a removable drip pan. The pan then pulls out and can be washed in the dishwasher. Unlike a traditional air fryer, no flipping of the food is required during the cooking cycle. This air fryer also features a unique rotating cooking basket and rotating spit that complements the constant air flow by keeping the food itself moving as well. How does the Power Air Fryer Oven stack up against its competitors? 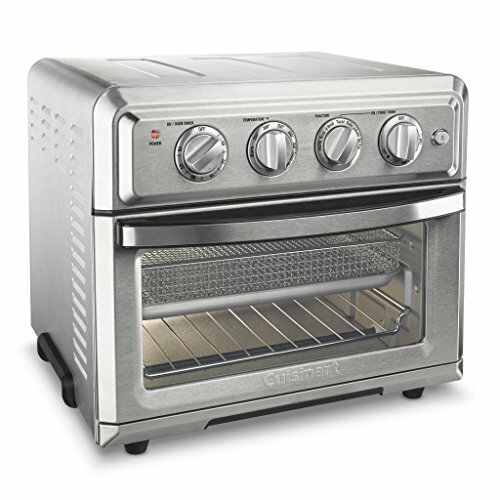 The Power Air Fryer Oven has a number of features that set it apart as a unique addition to the air fryer market. The following demonstrates a few of our favorites. The Power Air Fryer Oven may offer more air frying surface area than any other model on the market today. Three mesh air flow racks allow you to cook family sized portions of up to six different foods – all at the same time. You can also air fry using the rotating basket. The large size of the oven allows it to accommodate items as large as a 9 inch pizza or a five pound chicken. Rotisserie is a cooking style in which meat is roasted on a spit that turns constantly to ensure even cooking. 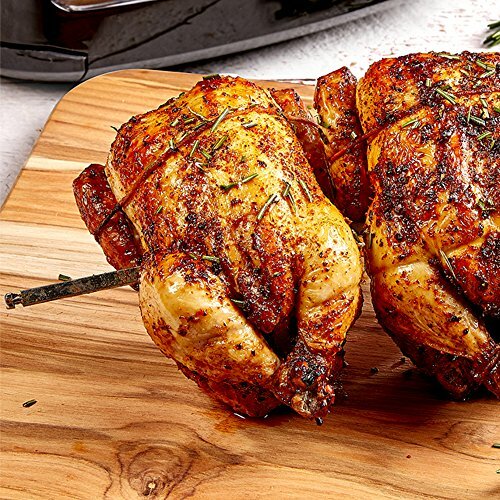 Stand-alone rotisserie appliances can be hard to find and take up a lot of space, but the Power Air Fryer Oven solves the dilemma of rotisserie at home. The PAFO has a motorized rotating spit that can be used with the rotisserie bar, rotisserie forks, kabob skewers, or rotating frying basket. In the past, dehydrating food at home meant long hours in the oven or an electric dehydrator taking up more than its fair share of counter space. Now, you can dehydrate your favorite snacks more quickly than ever in the Power Air Fryer Oven. Up to five racks can be placed inside the Power Air Fryer Oven when it is being used as a dehydrator. What dehydrated foods can you make? Try tangy beef jerky, crunchy candied bacon, or healthful dried fruits and vegetables. The Power Air Fryer Oven has a large touchscreen display, making it easy to use, even for those with limited eyesight. Controls include an on/off button, light, temperature and timer controls, rotisserie mode button, and eight cooking presets identified by a pictorial icon of the food item. Cooking presets include French fries, steak, fish, shellfish, fried chicken, cake, rotisserie, and dehydrator. Using presets, you can cook with the touch of a button. The Power Air Fryer Oven comes with three mesh air frying racks, providing ample surface area for cooking multiple portions of food. Additional racks can be purchased; up to five can be used when dehydrating food items. 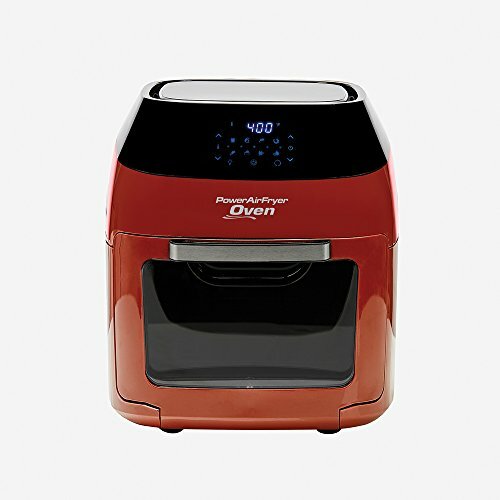 A selection of accessories and attachments come standard with every Power Air Fryer Oven, and a number of others can be acquired directly from the manufacturer. These attachments will allow you to use your air fryer like never before. All oven accessories are dishwasher safe for easy cleanup. Mesh racks and drip tray – Your Power Air Fryer Oven comes with three mesh air flow racks. Additional racks can be purchased. 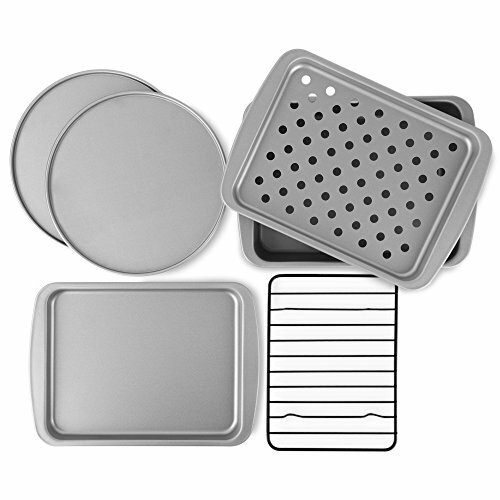 The removable drip tray will capture any oil, crumbs, or other drippings that falls from the cooking food. Rotating frying basket – The Power Air Fryer Oven’s unique stainless steel rotating mesh basket can be used to air fry French fries and more for an intense crunch. Rotating kabob skewers – Ten kabob skewers can be fitted onto the skewer racks, which utilize the rotating rotisserie motor. Rotisserie shaft, forks, and stand – Large or solid items, such as poultry or gyro meat, may be fitted directly onto the rotisserie shaft. Smaller items, or those that tend to slip, can be held in place using two rotisserie forks. The restaurant quality rotisserie stand will make you feel like a pro as you carve freshly roasted meats. Fetch tool – The fetch tool is a small metal wire tool with a metal handle. 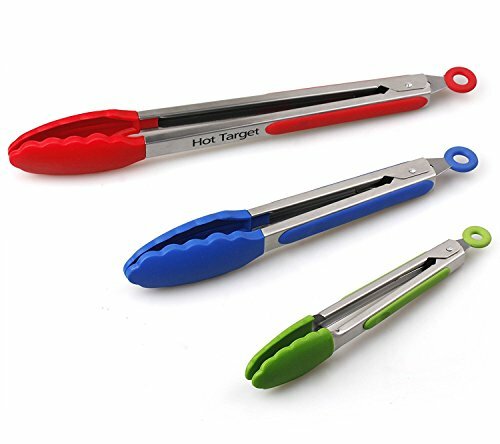 It can be used to safely push and pull hot oven racks or other items within the oven. Cookbooks – Four Power Air Fryer Oven cookbooks are available. 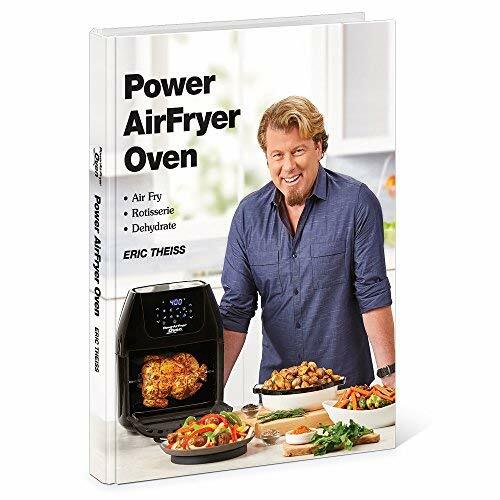 These include the hardcover Power Air Fryer Oven and the softcover America’s #1 Favorite Fried Food Recipes Revealed, Rotisserie Mastery Cooking Guide, and Dehydration Creations. For a full list, check out our recommended Air Fryer Cookbooks. Crystal clear window – Viewing your food as it cooks is not only helpful in determining appropriate cook times, but it is fun, too – especially when the rotisserie is in use. Unmatched versatility – The Power Air Fryer Oven is one of the largest air fryers on the market today, and the only one sporting a rotisserie spit. Limited 60 day warranty – Most comparable appliances include a warranty spanning a year or longer. Limited cooking times and instructions – Cooking times can be set by the minute up to sixty minutes. In dehydration mode, control is more limited – the timer can be set up to 24 hours in 30 minute increments. Mesh basket is hard to clean – Although dishwasher safe, the mesh of the stainless steel basket often requires additional cleaning to remove all food particles from the mesh. You can upgrade your Power Air Fryer oven to a larger size or to an elite model with additional features. Bigger is better – at least when it comes to the Power Air Fryer Oven. Most owners who have purchased the smaller 6 quart model regret not upgrading to the 8 quart model. 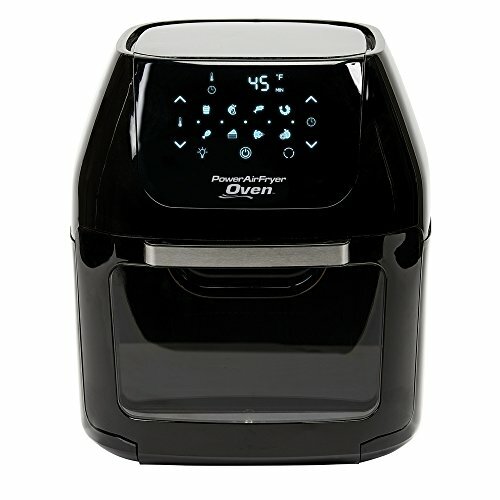 The 8 quart family size Power Air Fryer Oven is one of the largest air fryers on the market. This means that you can cook even bigger poultry and pizzas, as well as use larger oven safe dishes that you already own. 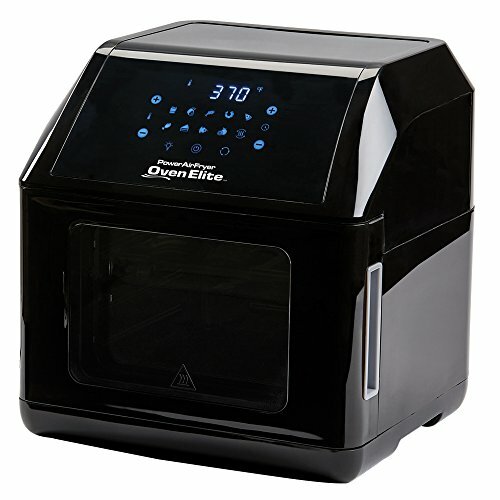 The Power Air Fryer Oven Elite is designed to be a cut above previous Power Air Fryer models. Its inner housing is constructed of metal rather than plastic, maximizing heat convections. The glass window is removable for easy cleanup, and the appliance door opens to the side to allow greater access to the interior. The air flow racks have raised edges to keep food in place or increase capacity, and a new locking system seals heat inside more efficiently. The Elite also includes two additional preset buttons – pizza and reheat. A large fry basket and the restaurant style rotisserie stand also come standard with this model. The only downside of this model is that the Elite only comes in the 6 quart size. Most customers who own this oven love it, and a few exclusive Facebook groups have spawned specifically to celebrate this cooker. Users like this unit’s capacity, versatility and features. Many users love the rotisserie option and the tray design, and several say that they use this unit daily or multiple times a week. Customers love that they can cook small or large amounts of food, and the flexibility and ease-of-use get a lot of praise. Overall, about half of the users give it a top rating. Multiple users report that the unit stopped working within the first several weeks of use. Although it has a 60-day warranty, customers report that the cost of shipping the unit back was too expensive and that their replacement unit arrived with no warranty. Many negative reviewers felt that the cost of the fryer was too much, given the problems they had. The Power Air Fryer Oven’s manufacturer’s warranty is limited to 60 days. As such, it is highly recommended that you upgrade to the extended warranty, generally offered by any retailer. Extended warranties may cover the product for one year or up to five years. Early Customers who bought the oven when it first came out had issues with their oven being DOA – dead on arrival. Straight out of the box, the oven would not work correctly or power on. The issues causing this problem have since been resolved. Another common issue was that convection fan would not turn on. This still seems to be a problem for a handful of buyers. If the Power Air Fryer Oven simply doesn’t suit your household needs, or if your goal is to replace your conventional oven with a countertop model, consider the following options. 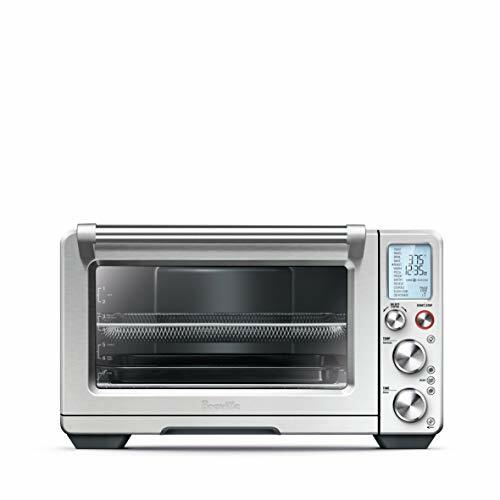 This 1800 watt countertop convection toaster oven has manual controls that allow for seven different functions – air frying, convection baking, convection broiling, bake, broil, warm, and toast. The 0.6 cubic foot interior has a non-stick surface. It is large enough to toast 6 slices of bread, bake a 12 inch pizza, roast a 4 pound chicken, or air fry 3 pounds of chicken wings. Other features include a 60 minute timer, a toast shade selector, and auto shutoff. Accessories include an oven rack, baking pan, and air frying basket. The oven weighs 28 pounds and has a footprint of 14 by 16 inches. The Breville Smart Oven houses six independent quartz heating elements, which adjust automatically depending on the cook setting. A two speed fan facilitates “regular convection” and “super convection.” You can use the Smart Oven for baking, roasting, air frying, and dehydrating. The large, one cubic foot interior will allow you to cook up to a 14 pound turkey or make nine slices of toast at one time. Cook on multiple racks, using the included 13 inch pizza pan, broiler rack, and air frying/dehydrating basket. Pre-programmed settings include toast, bagel, broil, bake, roast, warm, pizza, proof, air fry, reheat, cookies, slow cook, dehydrate, and rotate reminder. The oven weighs nearly 40 pounds and has a footprint of 26 by 19 inches. In a word, yes, you should invest in the Power Air Fryer Oven. This device represents a major upgrade from the traditional air fryer, which had limited capabilities due to its egg-shaped design. If you love your current air fryer but just want something bigger, with more features, more versatility, as well as multiple racks, this is the air fryer for you. However, if you are looking to replace the functionality of a conventional oven, the countertop convection oven might be a better choice. How Big of an Air Fryer Do I Need? Should I Buy an Air Fryer? Are Air Fryers Worth It?